The first three items in this menu are Cut, Copy and Paste, and as you'd expect they have the standard shortcuts: Ctrl-X, Ctrl-C and Ctrl-V (by default: all the shortcuts mentioned in this Help assume that you haven't altered them). If you Cut a file or directory, it will be immediately removed from the display and 'deleted' (see below for what that doesn't mean). If you change your mind, you can use Undo to retrieve it. (Copying and) Pasting a symlink behaves as you would wish: the new symlink has the same target as did the original. This normally applies to relative symlinks too; to alter this behaviour see here. The fourth item is Paste as Directory Template. Occasionally you may wish to replicate a directory and all its subdirectories, but without their contained files. To do so, Copy the directory, select the destination dir, then use this menu-item. The last item in this section is Cancel Paste. Since 4Pane 4.0 pasting usually happens in a separate thread, which allows large, time-consuming ones to be cancelled if you wish. Note that this doesn't always work, particularly when pasting from a slow device like a usbpen or over NFS. Talking of time-consuming pastes, since 4Pane 5.0 a paste's progress is displayed in the statusbar. Creating a file or directory is straightforward. The only thing worth mentioning is that, if a file-view pane has focus, the dialog gives you the choice of making a file or a directory; if a dir-view, you can only make a directory. Next comes Linking. 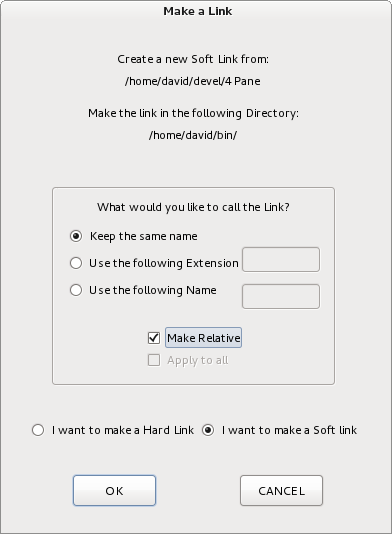 You can choose to make a Symbolic Link (Symlink) with Alt-Sh-L or a Hard link with Ctrl-Sh-L (note that the same metakeys are used to make the corresponding link in Drag'n'Drop). As with Pasting, you need first to have Copied the item(s) to be linked, then clicked on the directory in which you want the link(s) to be created. Choose a name to give the link: either keeping the same name as the link's target (providing you're not making the link in the same directory! ); using the same name plus an extension e.g. foo -> foo.lnk; or providing a new name of your choice. Change your mind as to which sort of link to make. If you are creating links to more than one file, you can make these choices 'Apply to all' of them. This isn't possible if you are choosing a new name for the links. The next two items are Trash (Del) and Delete (Sh-Del). These have similar meanings to normal, but different mechanisms. Neither actually deletes anything; instead files are moved to a newly-created temporary directory. This means that you can Undo a Delete! The difference between Delete and Trash is that the Delete temporary dirs are (really) deleted when 4Pane exits. The Trash ones are never lost, unless you use Options > Empty the Trash-can. There are three consequences of this. The first two are bad: Deleting a directory containing thousands of files and subdirectories will take a long time (on a slow computer a very long time); and Deleting a very large file e.g. a 4GB iso image, will take forever if it's on a different partition. The good news is that, were your computer to crash before you have a chance to Undo an accidental Delete, the file will still be available, probably in a dir called ~/Desktop/.Trash/DeletedBy4Pane/05-07-13__13-53-14/ where '05-07-13__13-53-14' is the timestamp of the Deletion. Third in this section (new since 4Pane-0.8.0) is Permanently Delete. This does what it sounds like: deletes without saving the files. So it would be a good choice for getting rid of large items you are entirely sure you no longer want; but beware, you can't undo this! 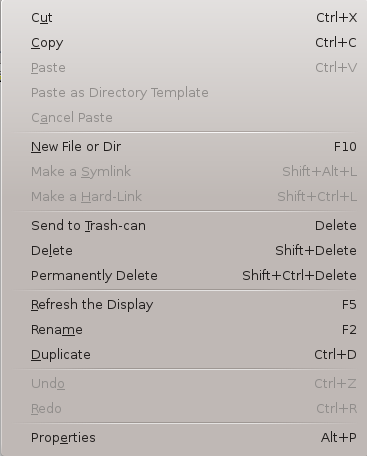 Then come Rename (F2) and Duplicate (Ctrl-D). Both of these are simple and obvious when applied to only one file or dir. However you can also do multiple rename/duplicate. Undo (Ctrl-Z) and Redo (Ctrl-R) are next. They are discussed here. Finally you can view information about the current selection, and change its permissions etc, in Properties.